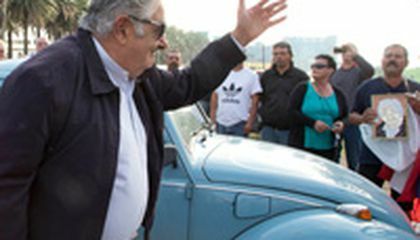 President Jose Mujica of the South American country of Uruguay says he has received a million-dollar offer to buy his blue 1987 Volkswagen Beetle, which has become a symbol of his modest lifestyle. The man once nicknamed "the poorest president in the world" told the Uruguayan weekly Busqueda that an Arab sheik offered $1 million for the humble car. When asked about the reported offer at a news conference, Mujica said: "That's what they said to me, but I didn't give it any importance." 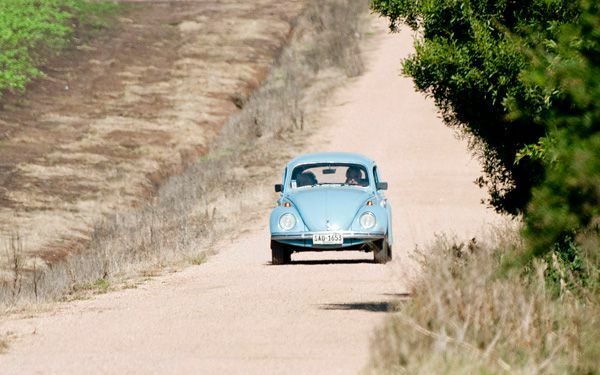 In an informal chat, Mexico's ambassador to Uruguay recently suggested to Mujica that he auction the Beetle in Mexico and predicted he could get 10 four-wheel-drive trucks for it, according to a spokesman for the Mexican Embassy. Mujica said that if he got $1 million for the car, he would donate the money to a program he supports that gives housing to the homeless. If he got trucks for it, he said, they could go to Uruguay's public health office or his campaign workers. The president said he would gladly auction the Beetle because he has "no commitment to cars" and he joked that he didn't sell it because of his dog Manuela, famous for only having three legs. Asked why someone would pay a fortune for his little car, Mujica noted that he keeps a hammer and shovel that belonged to his father. "They are little things to the world, but are worth a lot to you." Mujica gained world renown when he assumed Uruguay's presidency in 2010 and declared that his entire wealth amounted to the 1987 Beetle. The ramshackle farm he lives on was in his wife's name. Since then, in his official declarations of wealth, he has included the farm and he has been earning about $11,000 a month as president, of which he donates 20 percent to his political movement. Earlier this year he put his total wealth at $322,883, with the flower farm reportedly worth $108,000. Critical thinking challenge: How does the VW represent Jose Mujicas modest lifestyle? According to this passage, the president of Uruguay auctioned his blue 1987 Volkswagen Beetle. This car was on the market and got a bid for 1 million dollars. If the people that offered the bid decide to buy the car, the president will donate it to homes for homeless people. But, this president was charted on the list for the top poorest presidents in the world. Jose believes that the little things in life are more valuable to you!. Jose Majica is a very humble man that he became president with no money and continues to not become consumed by being a president. He is a very special man in that he is going to auction the car and use that to help his programs and country. I think other nations leaders should look at Jose Majica and be inspired that not being a nations leader means you get everything , and that giving back is more important then what you get. I think the beetle represents Jose Mujica's lifestyle because its humbleness. The beetle shows that not all leaders have to be wealthy and that is exactly what he is. It also shows how much he cares about his people since if it was sold he said he would donate all the money to charity. The amount that the car was worth before he was president and what it is worth now shows his dedication to do better. I think that Jose Mujica is a good person and I think he represents a person who has gone from 'rags to riches' because of helping people. That's some of the reasons I think the beetle represents Jose Mujica's modest lifestyle. President Jose Mujica of Uruguay is nicknamed "the poorest president in the world"-and it may be right. In 2010, when he was inaugurated, he declared his entire wealth rested on the 1987 Volkswagen Beetle he owns. He now estimates that he has 322,883 dollars, with an 8,800 dollar monthly salary (he donates 20% of his 11,000 dollar salary to his political movement). When offered one million dollars for the car, the president says he would gladly sell it because he has "no commitment to cars" and only kept it because of his three-legged dog, Manuela. I like this article because it shows a person in power who is very down-to-earth and doesn't care so much about their financial situation. I also wonder how President Mujica's security officials feel about the unarmored car and its safety allowances for possible assassinations. Clearly the price has more to do with the symbolism of the car itself rather than the actual value of the vehicle. It's also rather symbolic of what he would do with the money, essentially giving it away rather than capitalizing on the funding personally. Personally, i would find it worthy of adulation if he ignored the offer! That much money is not anofe money for what car I want to buy its 2.7 million dollars for my car that I want when I get older so I better start saving. The car I want Is a Bugatti veyron the fastest car in the world in some city's that is elegale to drive on the road it's so fast. There's no car in the world that would cost 1 billion dollars and no one would buy the car from you then because your insane if you want that much money for you car. It is good that the president didn't want to to sell his car even thought they offer him one million dollars if he likes that car because he feels good wit that car he should keep it no matter if is old.